Unfortunately, the time has come for me to move on from the CO2balance family to pursue other ventures. Heavy hearted, I bid farewell to the wonderful people I have had the privilege to work with since I joined the company in 2014. I am immensely proud to have called you all colleagues and friends. Every song ends but that is no reason not to have enjoyed the music. On the back of the Paris Agreement, one can be in no doubt that the climate change war is being won and the 21st century is destined to be shaped by the low carbon agenda. It has been an honour fighting from the same trench as you all over the past couple of years. Those on the opposing side in the climate change war appear to be weakening. They seem marginalised, defensive, feeling the argument slip away. Drip. Drift. Drain. Old energy to new cleaner ambition. I firmly believe CO2balance has been a voice, ratcheting up ambition on climate in both the UK and further afield, working with organisations to measure and manage their climate change impacts. CO2balance will end up on the right side of history, influencing the world for better since its inception in 2003, by practically creating innovative solutions that contribute to the energy transition required to move to a low carbon future. Part of a transition that will transform the world we live in. What an exciting thought that is. I would like to wish happiness and good health to every person I have worked with from the UK to East Africa. To my East African colleagues; no more and no less than all others, you possess all human attributes; talents, deficiencies, ambitions and virtues. It was wonderful to have met you all and you have left a lasting impression on my young life and I sincerely thank you all for this. Early last month, South Korea’s Songdo hosted to the latest meeting of the Green Climate Fund (GCF). CDKN’s Christina Elvers observed that compared to last year’s disappointing meeting in Zambia, GCF managed to make some major progress with the US signing the first tranche ($500m) of their commitment to the GCF. Riding on the momentum of the Paris Agreement, 2016 should be a very important year for the fund as it committed itself to take funding decisions worth $2.5 bn in 2016 for mitigation and adaptation projects. The main challenge is whether the fund delivers to those nations most in need. GCF’s stated aim of providing direct access to developing countries, and thus bringing about a “paradigm shift” in terms of access to finance for vulnerable countries. However many developing countries would need support in preparing the proposals, as the President of Kiribati rightly pointed out in the Guardian early this year. At the moment, many of these small developing nations do not have means to access the fund directly but only though accredited private entities such as banks and multilateral institutions approved by GCF. Understandably simplifying the accreditation process is not on the table, as accountability to donors as well as to poor people is of prime importance, point out Harjeet Singh from Action Aid. It is therefore a positive development that GCF has finally approved a readiness support to Rwanda whose direct access entity, MINIRENA, received a $1.5m grant to prepare the proposals. Many questions though whether it is the right decision to spend such large amount on preparation support and this is where carbon market frameworks come in the pictures. In 2012, the CDM High-Level Panel on the CDM Policy Dialogue proposed that GCF shall build on “CDM standards and methodologies in accounting for payments for verified results, so as to leverage the achievements, knowledge, and resources of the CDM”. While some part of their recommendations, such as purchase of CDM credits clearly cannot be considered due to the additionality criteria, it might worth to reflect on the lessons learned on this long-standing mechanism of emission reductions. Besides CDM, Gold Standard can also provide GCF with knowledge on how to set the standard which enables project developers to deliver high-impact, community focused emission reduction projects in developing countries. It is only by learning from these institutions’ past experience that GCF will be able to design a financial response that would truly lead to a paradigm shift. C02balance has a proactive approach to maintenance of its borehole projects in which maintenance work is done on an annual basis. This is usually followed by reactive repairs during the year to ensure that the boreholes are in constant use for the 7 years of the project. It also ensures that the communities have a constant flow of clean safe water and do not have to boil their water hence reducing carbon emissions from burning of wood fuel. With the help of our Project Officer, Isaac Okaka, we have successfully completed this year’s planned annual maintenance for the 41 boreholes in Otuke, Alebtong, Kole and Dokolo in the Northern part of Uganda. Our project Officer who is very knowledgeable about the borehole technology was assisted by the District hand-pump mechanics to complete the maintenance repairs for the boreholes in a period of one month. This year’s planned annual maintenance covered replacement of worn our parts, renovation of the aprons, greasing of chains, change of lower valves and pump buckets among others. The maintenance programme was gladly received by the community and some of them even offered to help with the repairs by providing labor like carrying pipes while the mechanics checked the inside pump system, helping to lift up the pump heads among others. This helps to strengthen community engagement and involvement in the projects hence giving them a sense of project ownership. In addition to this planned maintenance, routine chlorination and water quality testing had also been done to treat and test the water for its physico-chemical and bacteriological status. All the 41 boreholes registered satisfactory results which are in line with the Uganda National Standards maximum acceptance limits, therefore considered safe for human consumption. 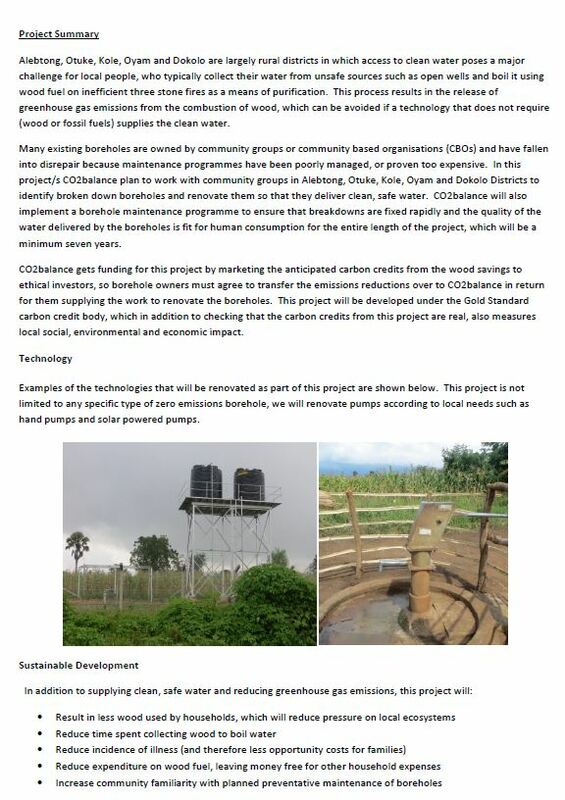 CO2balance intend to develop a series of new borehole projects under the GS1247 Improved Kitchen Regimes Multi-Country PoA in northern Uganda (Alebong, Otuke, Dokolo, Kole and Oyam Districts). As part of this process we are interested in receiving feedback during the early stages of our project design and are inviting any interested parties including international NGOs, local policy makers and community members who will benefit from the projects, to attend the Gold Standard stakeholder consultation at Omoro Town Council, Alebtong District on 6th May 2016, 9:00am. The meeting provides a great opportunity to raise interest and seek the opinions of a variety of groups on the project’s design, which we believe is a crucial step to enhancing community ownership and ensuring that the projects are well received. For more information about the project and venue please see the invite and project summary below. If you would like to attend or have any queries please do not hesitate to get in touch.